Oh, Joe Mantegna, I wish you were on every commentary. In case you’ve forgotten, in this episode Homer becomes the police force for Springfield and then Fat Tony tries to assassinate him, and then Maggie shots Fat Tony, and then it ends. If that sounds like a weak mashup of “Homer the Vigilante” and “The Twisted World of Marge Simpson” with a dash of “Who Shot Mr. Burns, Part 2”, that’s because that’s largely what it is. Fortunately, the commentary only rarely takes notice of the episode, and instead kills time with discussions of The Sopranos, Don Knotts and Dean Martin, it also finds time for funny stories from Mantegna and others. Only six people on this one, including Caroline Omine and Mantegna. 1:00 – The idea for this episode came when someone had to get one of those private security systems installed. 2:00 – Rehashing the origin of a joke about a fake monster’s wallet that shows up later. This leads to general banter of a not particularly remarkable kind. 3:00 – Mantegna was once in Australia shooting a mini-series, and interviewers kept asking him about Fat Tony and Simpsons. 3:20 – That leads to talk about the time Mantegna played Dean Martin. 4:00 – And that leads to a Dean Martin story about a time he called the cops on a party at his own house. 4:45 – Jean’s telling Mantegna that they’re going to kill Fat Tony and have him replaced by Fit Tony. I guess they were working on that worthless “Donnie Fatso” episode around this time. 5:05 – Mantegna’s talking about his Uncle Willie who was the basis for the Fat Tony voice. It’s funny. 5:50 – Following up on that, Omine and Jean talk about how sometimes people in real life think things on the show are based on them when they really aren’t. I guess Wikipedia used to say that Homer was based on Jean’s dad, but that isn’t true so he deleted it. 6:30 – Generalized discussion about how quickly the town riots. Jean then recounts how there were huge disasters in Southern California seemingly every three weeks in the early 90s. 7:20 – Apropos of nothing, Jean just asked Gould to do his Don Knotts impression. This leads to a story about meeting Don Knotts. 8:40 – Actual note on the show: sometimes the cast is kind of protective of their characters, so in this scene Bart is being eyed suspiciously by Homer for eating an apple instead of Lisa because Yardley Smith thought it was too Jerkass Homer (not her words) for him to be mad at Lisa. 9:35 – Selman’s telling a story about a time he called his security company because he heard a noise that turned out to be an ice machine. They told him he was supposed to just call and not be embarrassed, but he felt stupid anyway. Meanwhile, Homer just threw boiling hot nacho cheese on Snake. 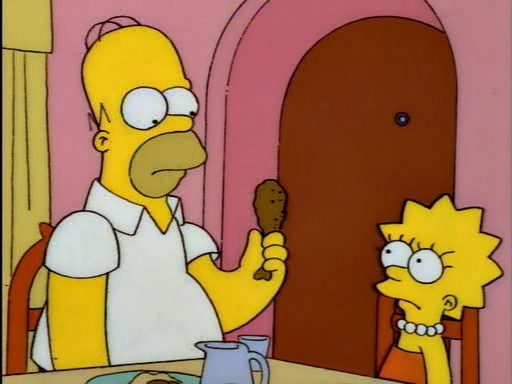 10:30 – The scene where Homer recounts all of the jobs he had is about forty-five seconds long. Jean jokes that if they did this now it would be like three minutes. 11:40 – No one remembers how they did the shot of Homer in front of the scared old lady in his security company commercial, where he has a shadow like he’s talking in front of a screen. This was pre-digital, and Jean mentions that one of the reasons they switched was because there just weren’t enough qualified people to do the hand painted cels. 12:25 – The joke where the monster in Homer’s commercial takes Homer’s business card and says “Monster put in wallet.” was a big deal for them. They talked about it way back at the beginning of the commentary. I’m not really sure why. 12:50 – Jean wants to give credit to Tony DeSena, which is this guy unless I’m spelling it badly wrong, for originally coming up with the idea of putting Homer into The Sopranos opening for a special he was doing. He was just going to use clips from old shows, but that gave them the idea to write new jokes and animate the whole opening themselves, and it’s become one of those insanely popular pop-culture crossovers. That leads someone else to joke that instead of writing new jokes and animating it themselves, they just animated it. 13:40 – Selman asks Mantegna if he was a Sopranos fan. Mantegna wasn’t really, he thinks that’s because he’s done so many of those characters and the fact that he didn’t have HBO at the time on account of he had little kids and was afraid of what they’d watch. 14:30 – Still talking about Sopranos. 15:20 – Selman asks Mantegna if people ever think he was on the Sopranos. They do, also Goodfellas. 15:30 – Prompted by virtually nothing, Gould brings up a link someone sent him to Ain’t It Cool that said he had to go. He laughs at this because he is, indeed, gone from the show. 16:00 – I think they’ve mentioned this before, but when Homer has to do something like make up his own lyrics to a song, it’s often Castellaneta improvising. 17:40 – They’re still talking about the wonders of editing, when the Sopranos-style opening starts up. 18:35 – As the opening winds down, Jean drops some Sopranos trivia, namely that David Chase wanted to do a different song every time, but HBO insisted that they use the same song since that would get the audience more excited. 19:00 – The ending, that Maggie saves Homer by shooting everybody, was apparently Jim Brooks’ idea. 19:35 – Mantegna is involved with some big Italian-American groups, and he likes to bring up Fat Tony as a way to tell them to lighten up about things. 20:35 – Jean then brings up the fact that the show likes to embrace every stereotype it can get its hands on. 21:05 – Talking about the positives of laughing at stereotypes continues until someone, sounds like Selman but I’m not sure, jokes, “But I do think all Italians are in the mob.” Mantegna doesn’t miss a beat, “Well, speaking for myself, yes.” Everyone laughs, and it was funny. 21:15 – And we go out joking that the show will finally end with Homer in a diner and then a black screen, just like The Sopranos. I remember this and the only gag I can remember being amusing was the two trucks playing catch with each other.